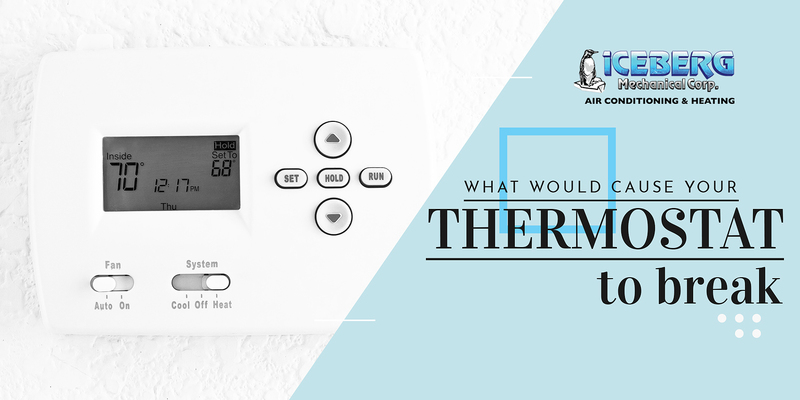 What Would Cause Your Thermostat To Break? A broken thermostat is not something you want to experience when the frosty season arrives. Unfortunately, this is among the most common HVAC concerns recorded in NYC. When it fails, it cannot regulate the right level of the temperature inside your home, making your space less comfortable and potentially increasing your energy cost. Do you know what really causes your thermostat to fail? Read on and find out! Thermostat installation is a complicated task; even professional installers find it a bit tricky. The most common issues with proper installation are when the bleeder valve is positioned upside down and when the device is installed backward. Your thermostat will still function. However, these issues cause a long delay in its operation. Just like any other components in your home, the thermostat will also reach the end of its lifespan. As it ages, the internal components simply wear out and cause problems in its operation. Your device is getting too old when it becomes hot while operating and eventually overheats. Sometimes human errors happen in the factory where the automotive components of your thermostat are produced and inspected. Even the minor issues on your device can bring major damages in its overall operation. Chances are you will have a malfunctioning thermostat straight from the box or minutes after installation. The thermostat uses the heat of the engine to open or close a valve. When the engine overheats, the thermostat also senses a too high operating temperature which its internal components are not designed to handle. As a result, your thermostat malfunctions and eventually breaks down. Take time to check the location of your thermostat. Does sunlight directly hit it? Is it close to heat-emitting appliances or near windows and doors? Thermostats should not be placed in these areas because it might give an incorrect temperature reading to your system. When was the last time you replaced the batteries of your thermostat? You might be thinking of major reasons why your thermostat is not functioning when the only problem is a drained battery which needs to be replaced. Take note that your device will not operate when its battery is out of charge. If you suspect any of these are happening in your NYC home, feel free to call our experts at Iceberg Mechanical. We’ll help you get to the root of the issue and fix it right away!